Jesus is oriented toward the Father. His face is set on God. As Saint Luke says, "Jesus steadfastly set His face to go to Jerusalem." Today's Angelus text given by Pope Francis is a marvelous for study and prayer. "If a Christian does not know how to talk with God, does not know how to listen to God, in his own conscience, then he is not free - he is not free." "So we also must learn to listen more to our conscience. Be careful, however: this does not mean we ought to follow our ego, do whatever interests us, whatever suits us, whatever pleases us. That is not conscience. Conscience is the interior space in which we can listen to and hear the truth, the good, the voice of God. It is the inner place of our relationship with Him, who speaks to our heart and helps us to discern, to understand the path we ought to take, and once the decision is made, to move forward, to remain faithful." Pope Francis presents Pope Benedict XVI as an example of this discernment. I recommend that you consider reading the Pope's Angelus text here. 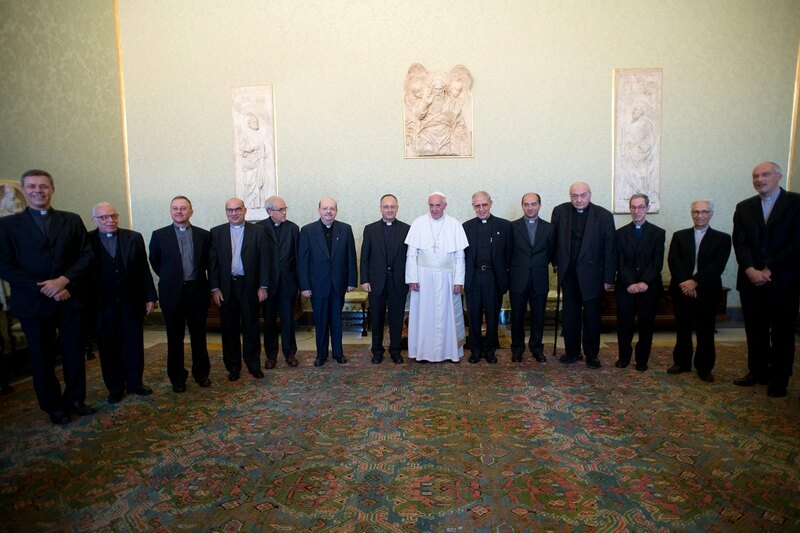 It is usual with a new Roman Pontiff that a meeting happens with the Jesuits who publish the journal La Civiltà Cattolica; Pope Francis met on June 14, 2013 with the Superior General of the Society of Jesus, Father Adolfo Nicolás and the editor, Jesuit Father Antonio Spadaro, and their respective staff members. The bi-weekly journal is a highly regarded publication that has a unique relationship with the Holy See since 6 April 1850 in Naples. La Civiltà Cattolica is Italy's oldest journal; the articles communicate the Holy See's point of view and is reviewed by the Vatican Secretary of State before they are published. The editorial policy works to confront significant problems of humanity, society and the Church, to publish articles on human, theological, philosophical, moral, social, cultural, political and literary formation, and they try to offer a chart important events related to Church life plus events concerning Italy and other nations. Three controlling ideas that will direct La Civilta Cattolica: dialogue, discernment, and frontier. I am happy to meet with you, writers, your whole community, the Sisters and the staff of the administration of the House. Since 1850, the Jesuits of the Civiltà Cattolica have been engaged in a work that has a particular link with the Pope and the Apostolic See. My predecessors, meeting with you in audience, acknowledged many times how this link is an essential feature of your review. Today I would like to suggest three words to you that might help you in your endeavor. Continue reading Pope Francis tells La Civilta Cattolica to be concerned with dialogue, discernment, and frontier. This page is a archive of entries in the Faith & Reason category from June 2013. Faith & Reason: April 2013 is the previous archive.